where <path to> stands for the directory where DeviceServer.jar is installed (e.g. the java directory of the SDK package). If the bash script is used it has to be installed in the same directory as DeviceServer.jar. By default default DeviceServer listens on port 9080 for HTTP connections and on port 9081 for socket connections and only accepts connections from localhost (127.0.0.1). The ports can be changed using -sp and -hp. Client addresses can be specified using -sa and -sb. Addresses with preceded “-” are permitted all addresses without “-” are allowed. the <mask> value it the number of highest significant bits hat have to math, i.e. a mask value of 24 is denotes the netmask 255.255.255.0. Multiple addresses can be separated by “,”. Starts the DeviceServer verbosely and only listens for HTTP connections at default port 9080. Connections from 127.0.0.0 to 127.0.0.255, 192.168.1.0 to 192.168.1.9 and 192.168.1.11 to 192.168.1.255 are accepted. A verbose log is written to logfile. specified errors are returned directly. 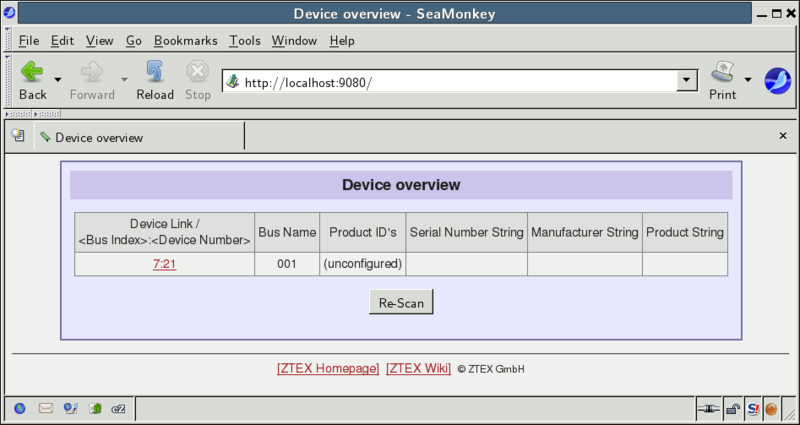 Upload firmware to USB controller. Returns errors, if any. Configure FPGA. Returns errors, if any. read out using "errors <cid>"
write data to endpoint. Returns errors, if any. Returns errors stored under <cid>. first reads data from endpoint 2 and writes it to outfile and then (2nd command) prints messages (if any) to stdout. 7:17    001     (unconfigured)  ""      ""      ""
The HTTP interface is even easier to use then the socket interface. This shall be demeonstrated with the same example as above. Note that at least some Windows versions does not know their name: the numeric address '127.0.0.1' has to be used instead of 'locahost'. 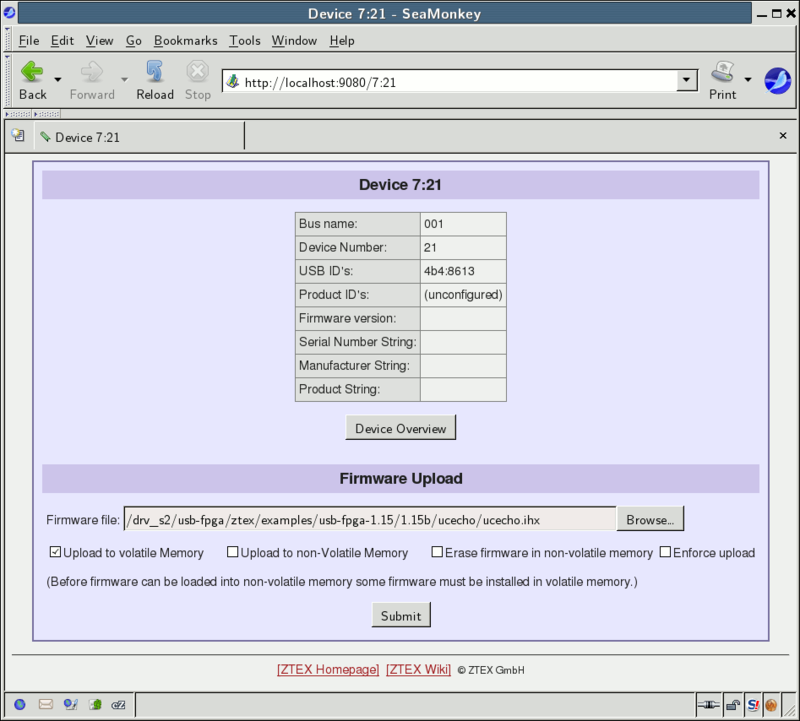 Step 2: Upload the firmware: Select the correct firmware, check the “Upload to volatile memory” and click the submit button. 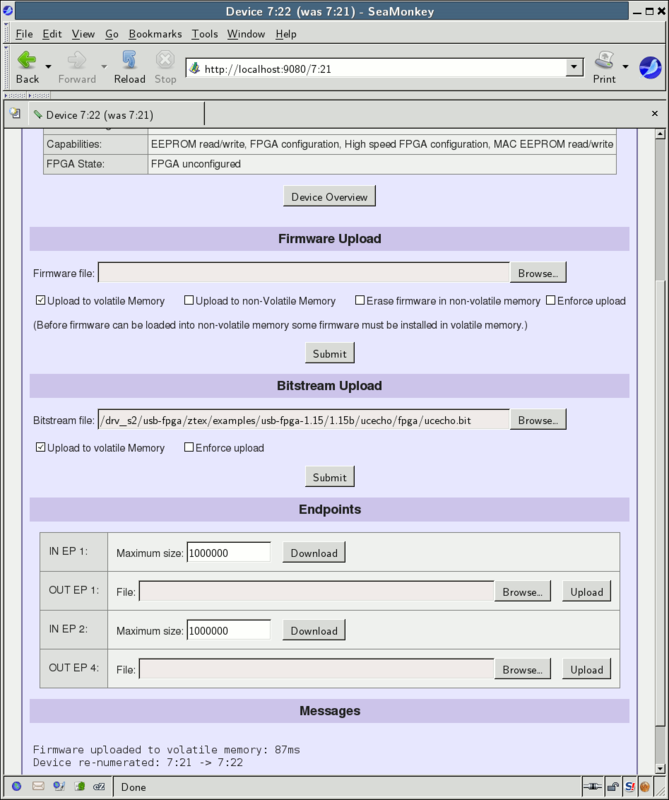 Step 3: Configure the FPGA: Select the Bitstream, check the “Upload to volatile memory” and click the submit button.